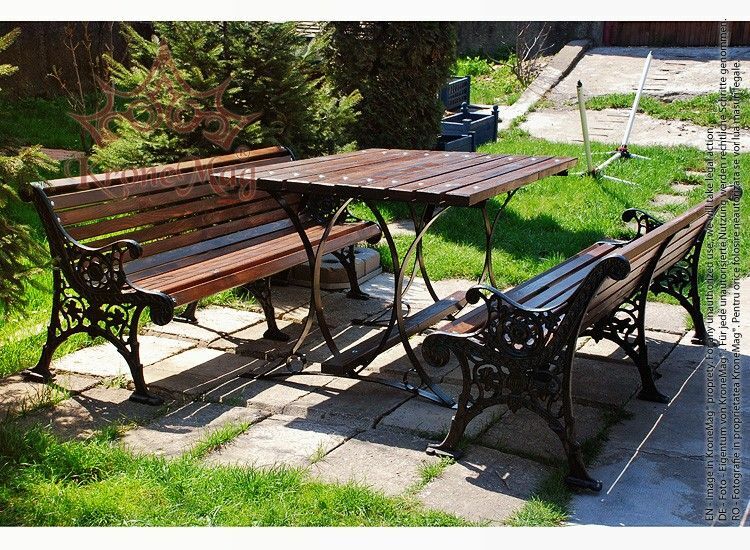 GardenBench Set PRAGA-FR is designed for parks, recreation areas and playgrounds and other place for relaxation. The picnic bench set is composed from one table and two benches. The cast iron ends and metal parts are powder coated. The coating is applied electrostatically and is then cured under heat. It is used to create a hard finish that is tougher than conventional paint, which gives the benches and table a higher resistance over time. Public Seating Bench MINSK-FR is made of cast iron and wood slats.This park bench is a classical and.. The Outdoor Cast Iron Bench OSLO-FR is made of cast iron and wood slats.This park bench is a classic..
Vintage Cast Iron Bench OXFORD-FR is made of cast iron ends and wooden slats.This park bench is a cl..
Garden, Terrace Table INEU.3 The INEU.3 table with steel feet and softwood elements is destined..
Garden, Terrace Table THAVISThe THAVIS table with steel feet and softwood elements is destined ..